Here in Ireland, Winter is gone and February 1st is Spring. Why? Because we still follow the Pagan Calendar here. Actually from February buds start appearing on trees etc so there is probably a little Science behind it too. Anyway I felt it time to get rid of the Old Winter Ale since it is no longer winter. I am a fan of many Fullers beers, not all are good but most of them are and some are exceptional like London Porter on Cask. The Old Winter pours a light reddish amber. There is a nice big white head too. There is little aroma but sweet malt, toffee and a little orange is noticeable. More obvious is the taste. It starts out very malty and an upfront sweet toffee with orange and a little spice but not much. Then the bitterness kicks in to balance it out and it does more than balance, it gets rid of much of the sweetness leaving a rather bitter beer. There is enough residual sweetness to balance the bitterness making this one of the types of beer I enjoy most. Dry, bitter with a hint of sweetness in the background to balance the bitterness. Carbonation is perfect giving you an almost chewy mouthfeel. Excellent beer and the 5.3 % will warm you in no time. Excellent pairing with the strong white cheddar I am eating. Pours a pale golden yellow. There is quite a bit of yeast at the bottom and as far as I am concerned that gets poured in to the beer for the extra flavour. 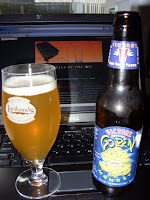 This Tripel Belgian style ale comes from the Victory brewing company in Pennsylvania USA. It reminds my wife of Belgium when she sniffs it. To me it also reminds me of Belgium but in a muted sort of way. It in no way reminds me of an average Tripel that is actually from Belgium. That is not a bad thing because I find many Belgian beers to be too sweet for my liking and this is sweet but not overly so and is balanced. The 9.5% of this beer comes through but not in your face alcohol so this is quite drinkable, well as drinkable as any beer of this strength. 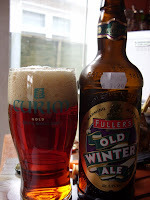 The Tale Of The Ale: Fullers Old Winter Ale & a Victory for monkeys.